Spread the word: wooden fashion accessories aren't just for lumberjacks anymore! This accessory is just right for the man with a unique personal style and a quirky sense of humor, who likes to keep things interesting, even when he dresses up. Suffice to say, this is knot your average necktie. These bold ties are made by David Steinrueck and Christopher Steinrueck from redwood beams, reclaimed from salvage yards in the San Francisco area. Once part of a barn or warehouse, planks are cut, sanded and varnished, leaving the wood's natural grain and coloring on display in a charming plain or vertical, striped pattern. Individual panels are connected with a hidden elastic cord, which slips easily around the shirt collar for a comfortable fit. Handmade in San Francisco. 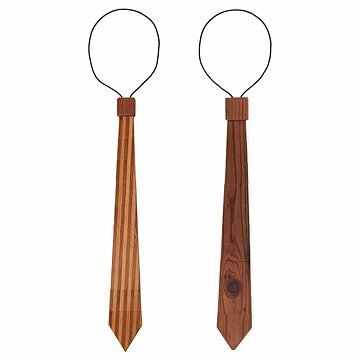 To learn more about these Wood Ties visit our blog! Head to our blog for a visit to the Steinrueck brothers' San Francisco studio! Please note the elastic cord is adjustable. You can also remove the top wooden piece underneath the wooden "knot" to shorten the tie. Got this as a gift for my brother, he is a 20something hipster/stylish professional. He loved it! Good quality, very unique and cool gift. It's a crazy fun attention getter! I'm very happy with my wooden tie. The wooden tie was a great Anniversary gift! He wore that day to work and enjoyed hearing all the cool comments about it! I got this for my friend who is a middle school principal- he loves it! And its a big hit with the kids! My husband loved this gift, wore it out to dinner for his birthday and got complimets within hours of wearing it. The wood tie is a unique item that generates interest and positive comments. Using reclaimed wood makes it even better! The tie looks just as good as it does in the pictures. It is certainly quirky but still works for formal occasions. They put in way more elastic than anyone needs so that you can adjust it to your own height and it will fit. You can trim the elastic if you want so there is no excess or leave it to readjust later. This remarkable necktie is made from panels of reclaimed redwood, suspended from an elastic cord.